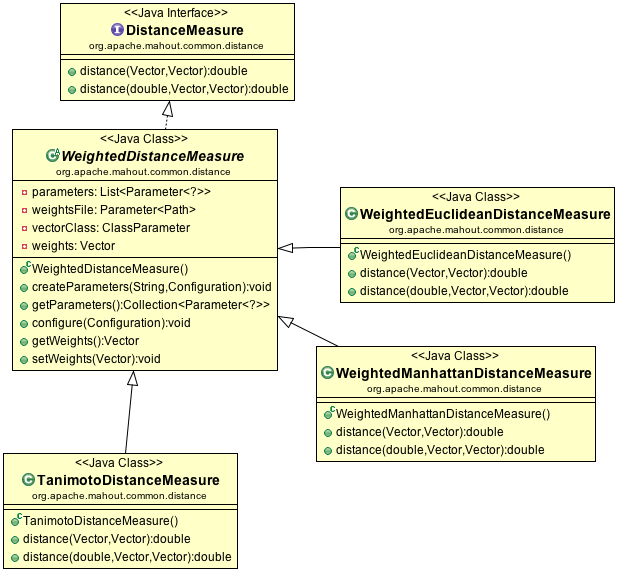 In Mahout, there are different distance measure classes defined in the org.apache.mahout.common.distance package. Among them are SquaredEuclideanDistanceMeasure, EuclideanDistanceMeasure, CosineDistanceMeasure, MahalanobisDistanceMeasure, ManhattanDistanceMeasure. These distance classes implements the DistanceMeasure interface. There is also support for weighted version of DistanceMeasure eg. WeightedEuclideanDistanceMeasure and WeightedManhattanDistanceMeasure. Both extends the abstract class WeightedDistanceMeasure. I was coding DAO for HBase 0.96 the other day and found out some API changes from 0.94 to 0.96. The introduction of new Cell interface and also KeyValue is no longer implementing Writable interface. Instead it implements Cell interface. With protobuf as the wire format, Scan, Get, Put are also no longer required to implement Writable. They extends abstract class OperationWithAttributes which extends another abstract class Operation and implements Attributes interface. The abstract class Operation mainly provides JSON conversion for logging/debugging purpose. The Attributes interface defines the methods for setting and maintaining Map of attributes of the Operation. * Short.MAX_VALUE which is 32,767 bytes. * @return The array containing the row bytes. * @return Number of row bytes. Must be < rowArray.length - offset. * containing array. Max length is Byte.MAX_VALUE, which is 127 bytes. * @return the array containing the family bytes. * @return Number of family bytes. Must be < familyArray.length - offset. * @return The array containing the qualifier bytes. * @return Number of qualifier bytes. Must be < qualifierArray.length - offset. * represents the time of insertion, but can be any value from 0 to Long.MAX_VALUE. * Integer.MAX_VALUE which is 2,147,483,648 bytes. * @return The array containing the value bytes. * @return Number of value bytes. Must be < valueArray.length - offset. * @return the total length of the tags in the Cell. * WARNING do not use, expensive. This gets an arraycopy of the cell's value. * Added to ease transition from  0.94 -> 0.96. * WARNING do not use, expensive. This gets an arraycopy of the cell's family. * WARNING do not use, expensive. This gets an arraycopy of the cell's qualifier. * WARNING do not use, expensive. this gets an arraycopy of the cell's row. Since we have different versions of Hadoop, sometimes we have to compile/deploy our codes against one but not the other. The ideal way is to setup profiles in maven to compile and create the artifacts accordingly. 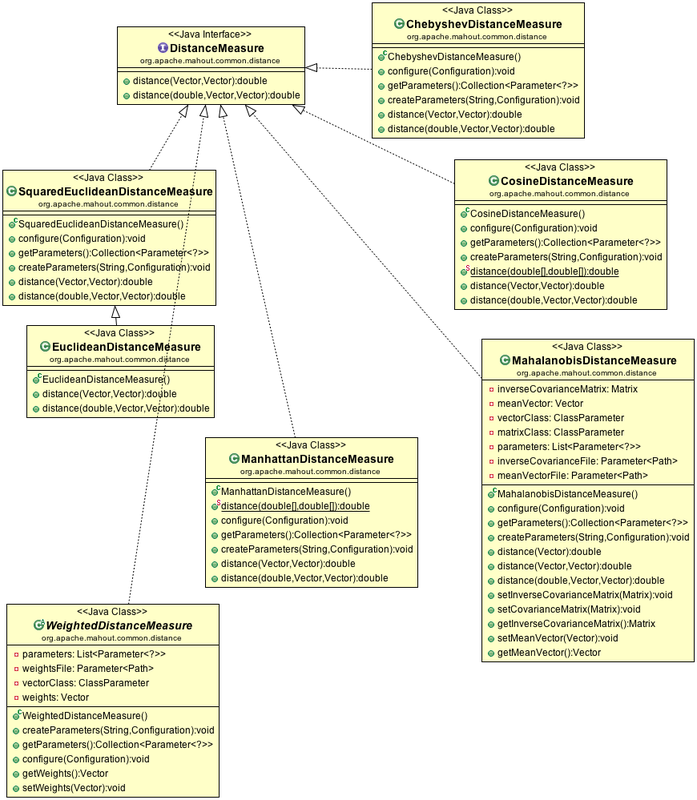 Here is the profiles section defined in HBase project. You can create the same profiles in your pom. <!-- This was marked as test dep in earlier pom, but was scoped compile. Viewing MapReduce job log files has been a pain. With YARN, you can enable the log aggregation. This will pull and aggregate all the individual logs belonging to a MR job and allow one to view the aggregated log with the following command.